Field #236, centered at: R.A. 15:28, Dec +30:00, was observed 3892 times through a standard I-band filter, in a period of 162 nights between 2004 Feb. 20 and 2004 Aug. 1. Observations were carried out in a PSF broadening mode where during the 300 seconds exposure time the telescope was stepped over a prescribed pattern, in order to achieve a better sampled PSF. 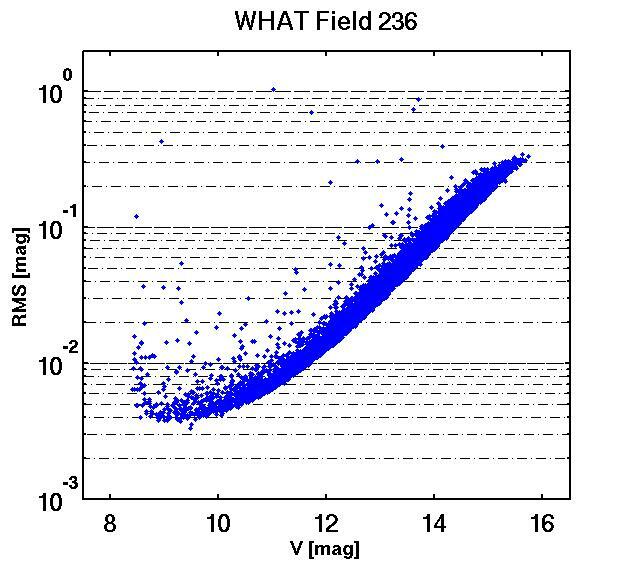 Light curves of 13360 field objects, with over 2500 measurements each, were extracted using aperture photometry. Systematics were removed with the SysRem algorithm (Tamuz, Mazeh & Zucker 2005). The figure on the right presents the RMS of each light curve versus its approximate V mean magnitude. The resulting scatter goes down to 4.5 milli-magnitude. All light curves were analysed using Analysis of Variance (AoV, Schwarzenberg-Czerny, 1989) and the Lomb-Scargle power spectrum (Scargle 1982) in order to detect periodic variables. A total of 152 periodic variables were identified, 133 of them new variables. Identified periodis range from 0.09 to 31 days, with amplitudes (peak to peak) down to below 0.01 mag. For the detection of peridoic variables we have also used the TFA algorithm (Kovacs, Bakos & Noyes 2006). All periodic variables can be viewed here. In addition, we have identified 14 non-periodic variables, 10 of them new, using the Alarm statistics (Tamuz, Mazeh & North 2006).